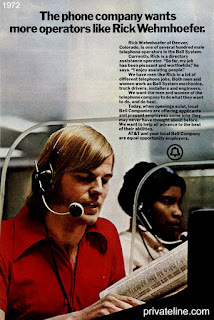 In early 1973 I was one of the first male telephone company switchboard operators hired by the Bell System (and Independent Companies) in the US in over 75 years. I was crossed-trained as a Directory Assistance operator (we worked with large paper directories) and as a Toll and Assistance operator on a manual cord switchboard built in 1948. I later worked as an overseas operator on old circuits in an International Operator Center. Some of my anecdotal operator stories, as well as operator history articles are on the website Privateline. Telephone history still interests me and look forward on this blog for photographs of original switchboards we used "back in the day." This is a short video I did a few years ago telling a comedic story about one of my experiences in those days. 411: For What City Please? from JR Snyder Jr on Vimeo.